I love the taste of Asian food and this looked like a good recipe to try. I marinated it overnight to give it a full flavor and itt turned out delicious. It was very moist and I loved the taste of soy sauce on my chicken. I would definitely make this again especially if I didn't want just plain baked chicken. I served it with two sides of veggies although I would have preferred to have my white rice with this dish. Mix first 6 ingredients in a medium bowl. Add chicken and coat with sauce. 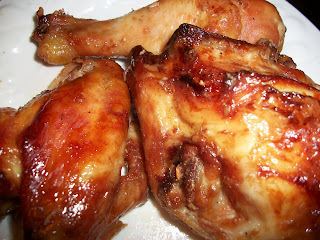 Let chicken marinate in sauce for at least 4 hours or overnight. Bake at 350 degrees for an hour and a half basting frequently.